“Mr David Farrant, 24, who reported seeing a ghost last month, returned to the spot last weekend and discovered a dead fox. ‘Several other foxes have also been found dead in the cemetery,’ he said at his home in Priestwood Mansions, Archway Road, Highgate. ‘The odd thing is there was no outward sign of how they died. Much remains unexplained, but what I have recently learnt all points to the vampire theory as being the most likely answer. Should this be so, I for one am prepared to pursue it, taking whatever means might be necessary so that we can all rest'." 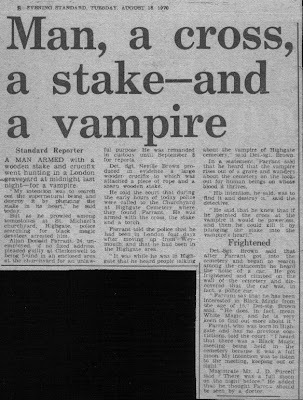 Two years earlier, however, in an interview given to journalist Marc Mullen in a vain attempt to raise his public profile, Mr Farrant fraudulently claimed that the "vampire was active again," as recorded in the Hampstead & Highgate Express, 2 September 2005. David Farrant in 1970 with a small sample of press cuttings. "Never lie, is really my motto. Just hold to the truth, and you can never really go far wrong!" Mr Farrant's "vampire hunting" was never anything more than a publicity stunt. He was quickly recognised as a compulsive publicity-seeker by most who met him. This suited journalists who found in him a free meal ticket. 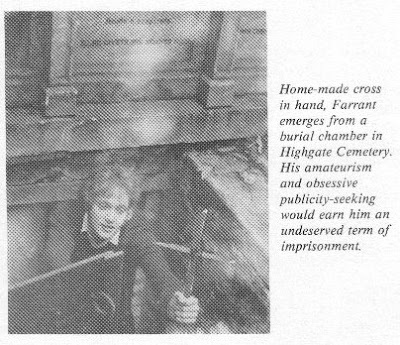 When he appeared at Clerkenwell Court in August 1970 where he was charged with being in an enclosed area for an unlawful purpose the magistrate had to acquit Mr Farrant of that charge because it was obvious to all present, not least defending solictor Mr Jeffrey Bayes, that Highgate Cemetery cannot be described as "an enclosed area." This technicality secured Mr Farrant's release in 1970. He would not be so fortunate four years later when he was convicted of rather more serious offences relating to Highgate Cemetery. We should nevertheless remind ourselves of what the magistrate, Mr J D Purcell, said when Mr Farrant first appeared before him whilst on remand at Brixton Prison: "You should be seen by a doctor." The interview he gave the BBC 24 Hours television team, which was transmitted on 15 October 1970, was solely because of what happened on the night of 17 August 1970 when police discovered him prowling about in Highgate Cemetery with a crudely made cross and a stake. The police had been anonymously tipped off by one of Mr Farrant's collaborators in order to guarantee maximum publicity in the media, as later confirmed by David Farrant's collaborator Anthony Hill. Without an arrest Mr Farrant would barely make a small paragraph on the back page of his local newspaper. The arrest assured national coverage and a television interview. This is exactly what he sought and it is why he orchestrated his own arrest. What Mr Farrant reconstructed for BBC television's 24 Hours showed him going through the actions of "stalking a vampire," as occurred at the time of his co-ordinated arrest. This footage was in relation to why he was arrested and comprised of nothing else. 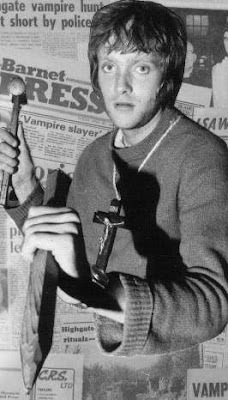 This particular edition of 24 Hours was titled Vampires and when asked about his "vampire hunting" David Farrant did not say, "I don't believe in vampires." Far from it. He went along with the notion he had given to all and sundry that he was in the graveyard to try and impale the Highgate Vampire should he ever encounter it. "I joined a macabre hunt among the desecrated graves and tombs for the vampire of Highgate Cemetery. ... David Farrant, 24, was all set, kitted out with all the gear required by any self-respecting vampire hunter. Clutched under his arm, in a Sainsbury's carrier bag, he held the tools of his trade. There was a cross made out of two bits of wood tied together with a shoelace and a stake to plunge through the heart of the beast. Vampire hunting is a great art. There is no point in just standing around waiting for the monster to appear. It must be stalked. So we stalked. Cross in one hand to ward off the evil spirits, stake in the other, held at the ready. Farrant stalked among the vaults, past the graves, in the bushes and by the walls. When we had finished he started stalking all over again."